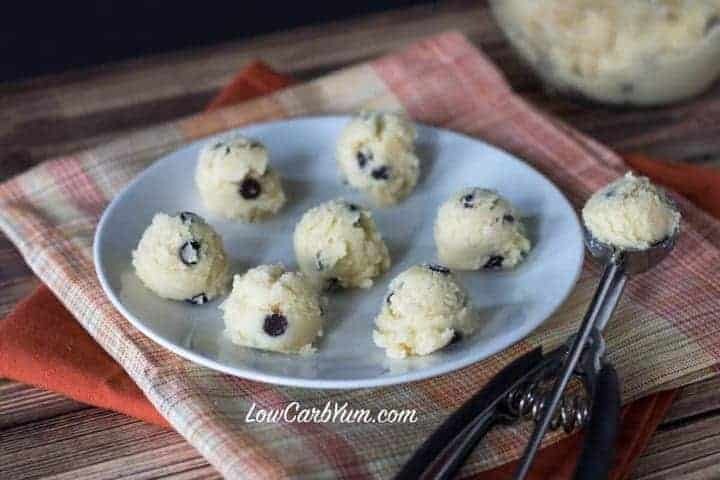 Gluten free low carb coconut flour chocolate chip cookie dough bites meant to be eaten raw. No baking required! Eat by spoonfuls or make bite size scoops. Are you a lover of simple and quick no bake recipes? With my busy schedule, I tend to favor the easiest and fastest recipes I can find. I just can’t afford to be spending too much time in the kitchen. If I didn’t have a job or kids to tend to, I could see myself experimenting more with complicated recipes. When my youngest child starts to get more independent, I may have more time for cooking and baking things I love. Or, if I can manage to retire early from work somehow. We can all dream, right? Since coconut flour is fairly inexpensive and easy to find. I worked it into a no bake chocolate chip cookie dough recipe. I know that coconut flour has more carbs than almond flour, but most of them are fiber carbs which aren’t so bad. You also don’t need as much coconut flour as almond flour when replacing regular flour in recipes. Most of the fat in almond flour is Omega-6 which has been found to cause inflammation in large amounts. The American diet tends to be overly high in Omega-6. It’s recommended to balance Omega-6 and Omega-3 in a ratio somewhere around 2:1 – 4:1 or lower. The typical American diet has a ratio more like 14:1 – 25:1 which is excessive. So, you should be aware of the Omega fats and try to balance them as necessary. This is one of the reasons I’ve been using more coconut flour and less almond flour. Butter, like coconut oil is also low in Omega-6. There is a fair amount of heavy cream used in this recipe. If you are concerned about the carbs in heavy cream, I suggest you only use pure heavy cream that doesn’t contain any additives. I buy Farmer’s Cow heavy cream.It’s a local brand that doesn’t contain carrageenan or rBHT hormones. Carrageenan is a common natural food additive found in heavy cream and other dairy products. It is a highly processed compound derived from red seaweed. Like excessive Omega-6, carrageenan can cause inflammation. I’ve been reading food labels carefully to avoid it. It does add carbs and can lead to glucose intolerance, insulin resistance and inhibition of insulin signalling. Doesn’t sound like something a diabetic should be eating! You can read more about the dangers of carrageenan at Dr. Weil’s website. My father has been following Dr. Weil for a couple decades. And, I started reading his newsletters over 15 years ago. That’s about when I started cleaning up my diet and using natural remedies. I share my experience with alternative medicine and more on my allnaturalideas.com website which was just launched last week. Some people do prefer the taste of almond flour over coconut flour as almonds have a more neutral taste. The distinctive taste of coconut flour doesn’t bother me. 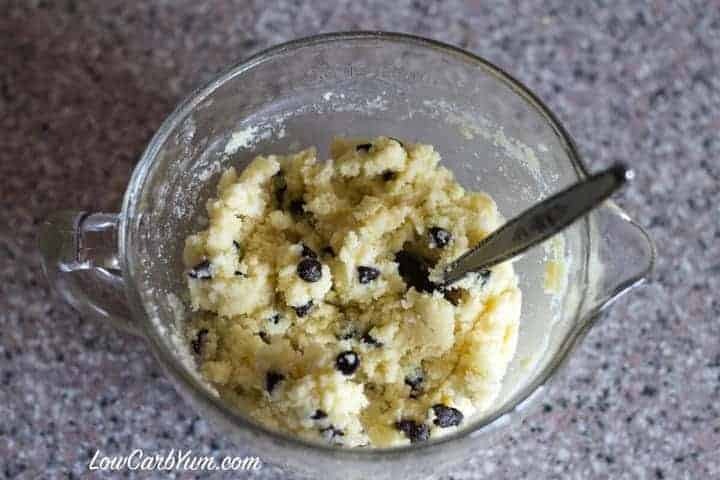 If you don’t like the taste of coconut flour, these low carb chocolate chip cookie bites could probably be made using almond butter instead of the coconut flour if you prefer. It wouldn’t need nearly as much liquid so you could reduce or possibly eliminate the heavy cream. I may try an almond butter version next time to see how it compares to this coconut flour based recipe. 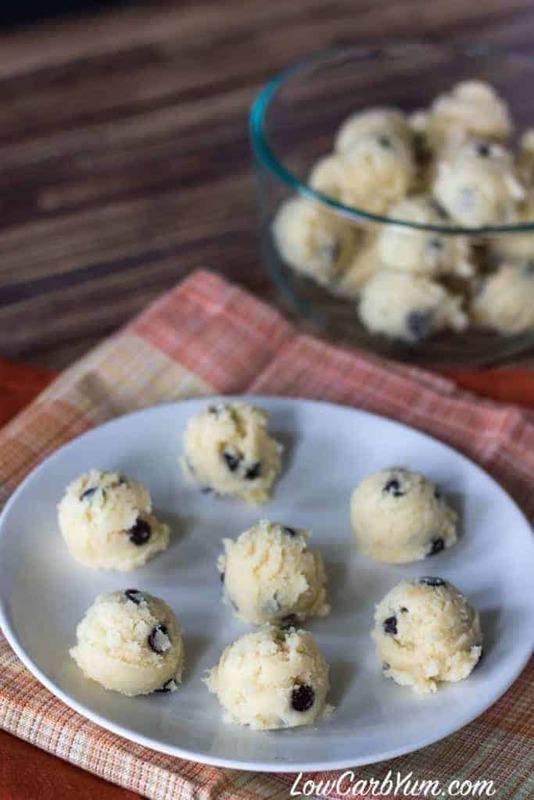 Gluten free low carb chocolate chip coconut flour cookie dough bites meant to be eaten raw. No baking required! Eat by spoonfuls or make bite size scoops. In large bowl, combine cream, sweetener, coconut flour, butter, vanilla, salt and syrup sweetener until well blended. Scoop into bite size pieces or spoon to eat. Store in refrigerator. 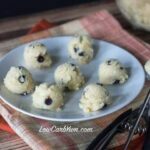 [post_content] => Gluten free low carb chocolate chip coconut flour cookie dough bites meant to be eaten raw. No baking required! Eat by spoonfuls or make bite size scoops. I made this recipe today with a little modification and it definitely satisfied my sweet tooth! I didn’t have chocolate chips so I made it with 1/4 cup cocoa and used about 30 drops of liquid stevia. I think they would be perfection rolled in unsweetened coconut!! Made these last night, quick and easy. I love the slight coconut-y flavor they have. My kids were excited that it was not almond flour because they could take these to school. Perfect for a little fix of something sweet-ish when I need it and it makes enough for several days (with 2 boys I’m lucky it’s not hours) worth of treats! I have to make a few batches for these to last more than a couple hours in my house. Glad the kids enjoy them. I agree! Big Lakanto fan here! 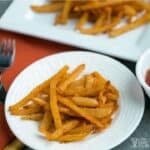 Just made this recipe (with a few modifications) and they are DELICIOUS. It was so easy, too! Easy to make and clean up. I used the food processor, and as it was mixing, the batter looked a bit dry, so I used the entire pint of whipping cream. Swerve for the sweetener. Himalayan pink salt. And I couldn’t find chips, so I just chopped up half of a 100% cocoa baking bar into chunks and shavings and stirred it in. Plus after scooping it out into balls, it made SO MANY. Like 30 little balls. This is the perfect little Keto treat! Thank you! Thanks for sharing your mods and letting us know how it worked out for you! Followed the recipe 100% and they turned out perfect, so easy to make and delicious!! Glad you enjoyed them Steph! These were fantastic! Perfect treat to curb my sweet tooth. Thank you so much for sharing! Sorry, I appreciate the effort, but I don’t appreciate the expensive, wasted ingredients. This is a sad substitute for cookie dough. I’ll give you that it looks like cookie dough. 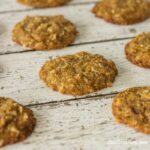 I would think it would be a better philosophy to only post recipes that are actually good and tested, even if it means you CAN’T replicate cookie dough. There are so many fantastic desserts that CAN be made delicious and low carb, I don’t understand posting one with your name on it that is so very sub par. I wanted it to be good, but it so wasn’t. 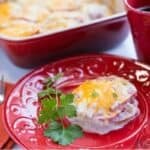 There are many who like this recipe, including my friends and family. Perhaps your ingredients were off. Rude. everyone is going to like everything. You don’t have to ruin it for everyone else. Certainly there must be a better way to get across your point without attacking the author of the page. Live and let live, my friend. Happy baking . 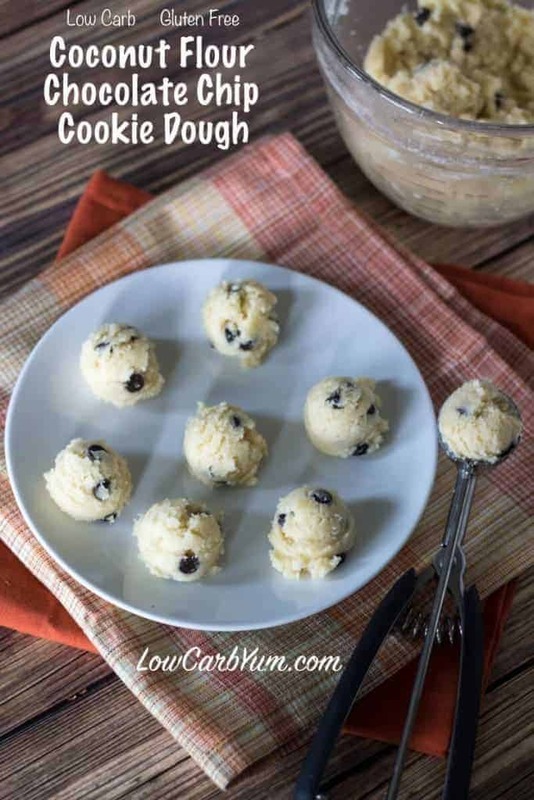 I followed the instructions exactly, and these did not taste remotely like cookie dough to me; however, they will do in a pinch if you need to satisfy your sweet tooth craving while doing keto. I know you said “any” sweetener can be used. Does that mean maple syrup and honey as well? As long as you don’t mind the carbs, those work too. I made this tonight and I know the coconut flour taste will need an adjustment, but my husband and I both found it to be very dry and lacking something. We were thinking it needed more butter and a bit more sweetener. The butter will help with dryness and flavor. Sweetness is a matter of preference. I’ve been on keto so long, I have lost my taste for sweet so those still moving away from sweets likely need more sweetener. Ok yeah, you are right about that… original receipt ( well appreciated) but… soo dry. I feel like bloggers HATE this question…but I will ask anyway – would coconut CREAM work instead of heavy cream? I haven’t tried it (although it’s what I’d use now that I’m dairy free), but it should definitely work. Can I use almond flour? My husband is allergic to coconut but we’ve still been making the keto diet work. You really need coconut flour for this recipe as it absorbs the liquid. Almond flour doesn’t do that. Hey Lisa ! Love your recipes! Do you know if anyone has tried freezing these? I freeze alot if goodies and like to eat them straight out if the freezer…. especially anything with chocolate. I haven’t, but they should freeze well. And, I bet they’d be pretty tasty frozen. I just tried making these today but all I had on hand was half-and-half, not heavy cream. I ended up adding a little more in because the dough was crumbly. Do you think using that was the cause? Or maybe the type of coconut flour I used? It could be a little of both. Do you think coconut cream could easily replace the heavy whipping in this recipe? I’m lactose intolerant and due to that, I find doing the low carb diet difficult because it leans so heavily on dairy. I’ve had good success replacing heavy cream with coconut cream. So, I think it would work. It will give more of a coconut taste. Heavy cream ‘should’ be mostly fat. Lactose is milk sugar. Therefore there is little to no lactose in heavy cream. Most carbs in heavy cream come from stabilizers not lactose sugar. If you have a Trader Joe’s nearby, they have the best heavy cream (or double cream) which is the highest fat heavy cream. Love these little cookie bites! With the slight dairy taste from the cream, I feel like I just had chocolate chip cookie dough ice cream! Great treat with low carbs…I used stevia baking blend and Lindt 90% chocolate cut into small pieces. 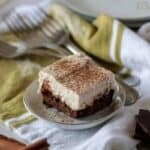 Very few low carb desserts make it to my recipe box, but this one will. Thanks for sharing it! Thanks for the review Krista! So happy you enjoyed them. 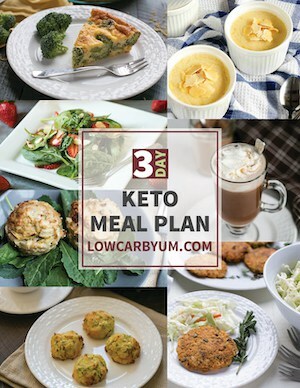 I make these all the time…so delicicious and helps me stay on a keto diet. Great recipe! Hi Lisa, I read in your article that coconut flour has more carbs than Almond flour but all the ones I’ve seen, it’s reversed. All almond flours I’ve seen are much higher than my coconut flour. Maybe I got lucky lol I can’t wait to try these!!! For the same amount, coconut usually has more, but you use less which results in fewer carbs. The link doesn’t seem to be working. Can you share the recipe please? Hello. Thank you for this recipe. Is the nutrition info for 1 cookie bite? How many should this recipe make? You get about 27 bites, the nutrition is for 3 of them. Mine was very grainy and not smooth. What can I do to make the texture better? Was it the coconut flour brand? If you use a fine coconut flour, it shouldn’t be grainy. I use either Anthony’s or Betterbody. Sheesh, I have to read a long boring article before I can get to a recipe? It’s easy to just scroll to the bottom! That was a tactless and rude comment, JC. Thank you, Lisa, I’m excited to try this. Thanks Hollie! I really like this quick treat because I’m a huge fan of coconuts and coconut flour. I’ve found that if you [Ctrl+F] and type ingredient into the search box, it will take you to the recipe faster. I think that it’s an unwritten rule that all food bloggers must write an essay before posting the recipe. Thank you for making my chocolate chip cookie dough dreams come true! SO amazing, completely easy, and perfect for warm weather. Is there a dairy free option, such as using coconut cream or full fat coconut milk instead? Thanks! You can try a smaller amount of coconut milk and add more if needed. I don’t see why it wouldn’t work. It just needs to get absorbed in by the coconut flour. You keep saying almond butter in the post. Do you mean almond flour? Nope. I actually think this could be made with almond butter in place of the coconut flour. Other adjustments may need to be made, though, including the amount of the almond butter vs. coconut flour. Your link in the recipe for the coconut flour takes me to unsweetened dried cranberries. Looking forward to trying these!! I just updated the recipe software and I’m thinking it may have messed up some links. Thanks for letting me know! Thanks for sharing how they worked out for you Trish! Eek! Don’t use splenda! Swerve is a better choice! Instead of Splenda can I use Stevia? If so how much? Total newbie to low carb eating but I’ve heard it’s a lot more sweeter….? There’s no Splenda used in this recipe. You can use any sweetener you’d like. 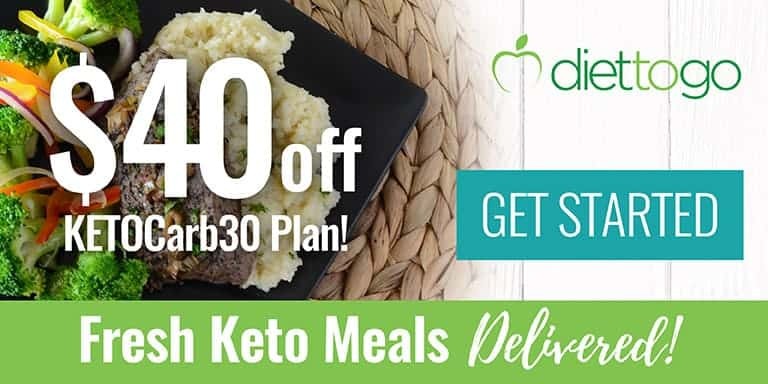 Anyone tried using carbquick instead? That’s all I have right now but don’t want to waste anything. I have noticed some variations in coconut flour. The kind I use absorbs liquid like a sponge. Sounds like you needed to add more coconut flour or less liquid to account for the differences in coconut flours. It was delicious! A little dry, but worth it! Reminds me of a healthy caramel delight Girl Scout cookie! You can always add a little more liquid if needed. I made these last night and I LOVE THEM!!!!!!! Thank-you so much for this recipe! Perfect for my sweet tooth! I have a major sweet tooth and doing low carb is not always easy but with a dessert like this every so often I think I can survive it now. LOL! Glad you loved them. They are one of my favorites because they are so quick and easy to make. Can these be be baked? They are made to be eaten raw. If you want baked ones, you’d have to add eggs like these basic coconut flour cookies. That’s exactly what I did, thanks Lisa! Wonder if I could make it without the sweetener. 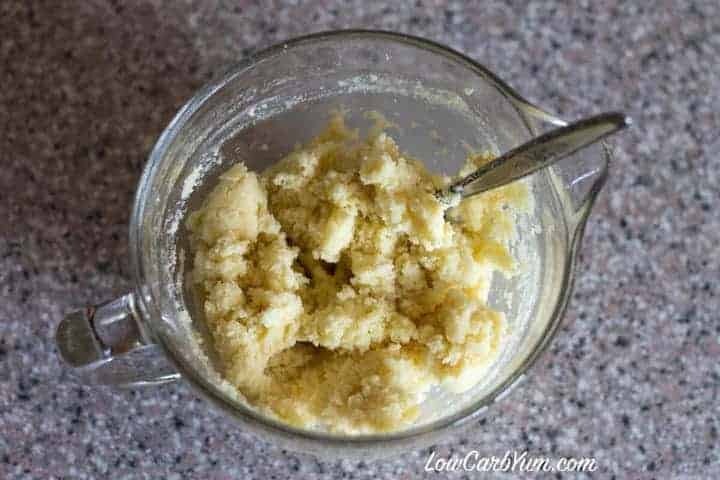 Coconut flour tastes sweet to me as it is, and I’ve tried eliminating sweetened foods and don’t want to introduce fake sugars into my diet but would like to have a snack every now and then. Anybody try it without the sweetener? If you’ve cut back on sweeteners and rarely eat sweets, it would probably be okay for you. Most people would probably need a little sweetener added. If you decide to try it with almond flour, do I need to adjust anything? Honeyville makes a great flour that I have gotten at Costco and it makes awesome pancakes. I’d like to try it with this too! You may need more almond flour. And, you’d likely need to cut back on the cream. This was the perfect “play-doh” consistency. My kids had a blast playing with it and then eating it. Thanks for the yummy recipe! My whole family approved. LOL! My youngest daughter loves Play-doh. Maybe I should let her help with this one next time. These looked so good in your pictures that I just had to try. So, I did this evening – YUM. The taste was an adjustment to me at first because this is my first time using coconut flour aside of dusting fish. They became delicious to me by my second bite. Thanks so much for this recipe. Glad you enjoyed them. I absolutely love coconut flour now. It did take me a short time to adjust, but it’s my favorite low carb flour now. Hi Sarah! These cookie dough bites will freeze well. I kept them in the refrigerator, but they only lasted a few days. I’d say they should keep well for at least 3-6 months in the freezer. I’ve had great success freezing fat bombs and baked treats too! I love coconut flour, and this is a great way to use it. Do you think a can of coconut milk could replace the heavy cream and butter? I’m not sure about the butter, but you can use coconut milk or cream in place of the heavy cream. You may want a little coconut oil to replace the butter. I love the idea of using coconut flour, I will have to try it! Pinning this one! Any sweetener can be used. You’ll need about 1/4 cup or so of sugar equivalent.